Why should some have the right to pass power? What would happen without government? How much power should the state have? 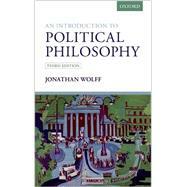 An ideal introduction for students with no background in the subject, An Introduction to Political Philosophy, Third Edition, combines clarity and a conversational style with a thought-provoking account of the central questions in political philosophy. Author Jonathan Wolff explores the subject through a series of enduring and timeless questions, jumping centuries and millennia to explore the most influential answers and demonstrate how political philosophy is relevant to contemporary issues. 4. The Place of Liberty?